Miner. A few useful tactic tricks! | Clash Royale fan-site! Home » BLOG » Miner. A few useful tactic tricks! Miner. A few useful tactic tricks! Miner – legendary card that can be unlocked after promotion to Arena 6 Builder’s Workshop. A distinctive feature of the card is that the miner can be deployed in any part of Arena (all the rest cards except of Goblin Barrel can be deployed only on own part)! 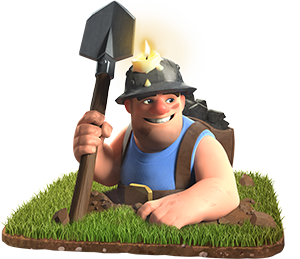 This and relatively low elixir cost make Miner popular (according to statistics almost 5% of all players have Miner in their deck). Miner is an attacking troop mostly. 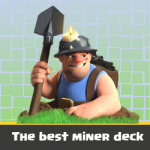 I like this card and I have it almost in every my deck, because a combination of miner with any other fast troop allows conducting fast and dangerous counter attacks (for example, Miner with Goblin Gang or/and Bats can destroy opponent’s tower for few seconds…). In defense, as a rule, Miner is used only in case of acute necessity. In this post, I’ll show a few tactical tricks with Miner that very often allow to get a victory or successfully repulse opponent’s attack. Blocking of Inferno Tower or Tesla. If you have any tank-type card in your deck (such as PEKKA, Golem, Giant, etc.) and opponent actively uses Inferno Tower to eliminate it, you can try to block tower with Miner. What do I mean? As a rule, players put Inferno Tower (or Tesla) in the same place during the whole battle… Thus, in the moment, when your main tank approaches the bridge, launch your Miner directly to the place where opponent deploys his Tower (do not wait until it appears in the Arena… launch your Miner earlier). Separating of attacking units for better attack repulsing. How often do you see situation, when opponent deploys “heavy” card first (such as Golem, Giant, PEKKA, etc. ), and then another one to cover it (it can be, for example, Wizard, Executioner or Witch…)? I’m sure that often… As a rule, covering unit moves behind the main tank and eliminates all threatens… So, with the help of miner, we can easy to split such opponent’s combination and eliminate them separately. All we need is to let them get closer and then launch the miner to place directly behind the second unit’s back. Such trick works great not only in defense… You can use it in attack also! For example, you just started own attack with Giant and Minion Horde and opponent put his Executioner as a response… Quickly throw the miner behind the executioner’s back… Such move will give enough of time for minions to eliminate the executioner. Good luck and see you on Clash Royale arenas! Arena 10: Super-efficient, fast and low-cost Miner deck! 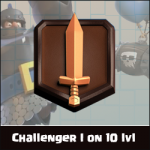 Getting to “Challenger I” as a 10 lvl player is quite possible (deck, tactic tips, etc.)! 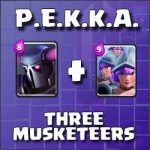 P.E.K.K.A and Three Musketeers – both in one deck! 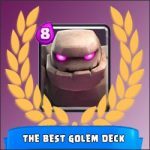 Arena 8: the best Golem deck! « Getting to “Challenger I” as a 10 lvl player is quite possible (deck, tactic tips, etc. )!